Unusual amounts of snow lead to many things—stalled cars, snowball fights, and airport closings. They also lead to many homeowner concerns over the roof's ability to hold the weight. Find out what you can do to identify or prevent problems. Late last year, Buffalo, New York, recorded a record amount of snow—and winter hadn’t even begun yet. More than a few homeowners in the city may have been concerned that their roofs would collapse under the strain of a surprising snow load. Roof collapse is something that many people worry about, with or without several feet of snow heaped up beyond the front door. How much snow can a roof hold, anyway? And are there steps you can take to avoid a worst-case scenario? Because there are so many variables involved, this isn’t a simple topic to address. The weight of the snow is a critical factor; half a foot of wet snow tips the scale about the same as a yard of dry, fluffy snow. And everything from a roof’s structural design to its shingling material ultimately influences its ability to support the weight. 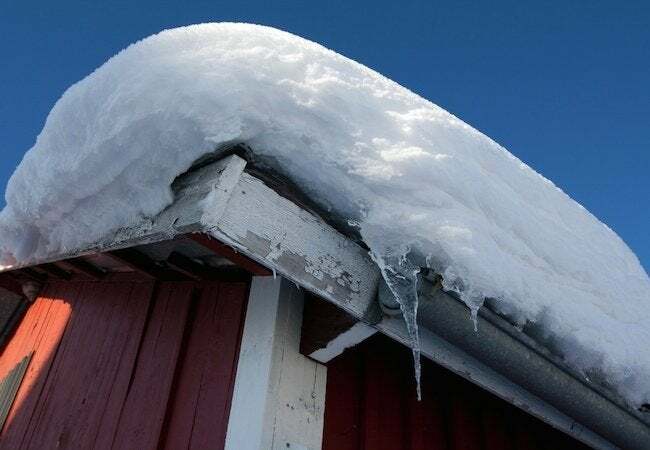 Generally speaking, steep and smooth roofs shed snow more easily than flat, or only slightly pitched, roofs. But ultimately, what amounts to a dangerous accumulation of snow on one roof would be just fine on another roof down the block. Like each snowflake is different, each roof can hold a different amount. While you can draw some conclusions by looking at your roof from the curb, it’s indoors where you’ll find the most instructive clues to a potential problem. Head up to the attic and examine the rafters for any noticeable bends or cracks. If you find anything that gives you pause, bear in mind that it’s not necessarily, and most likely isn’t, a sign of impending roof collapse. There are many possible explanations for damaged rafters—for example, termites. And even if snow is to blame, you may be looking at damage from a previous winter. In any case, ask a licensed structural engineer to evaluate the problem promptly. Elsewhere—particularly on the upper floors, toward the middle of the house—keep an eye out for new cracks in the drywall or plaster surrounding interior door frames. If those doors are suddenly sticking when they used to open and shut with ease, this could be an indication that the frame of your house has shifted due to a structural issue. Again, wall cracks and sticking doors are not cause for panic; rather, they are reasons to seek out the advice of a licensed professional. Some experts maintain that it’s unnecessary to remove snow from the roof, because any home built to the standards of the local building codes should be structurally equipped to handle virtually any snow load. Still, many homeowners wish to take every available precautionary step. Be aware, however, that climbing up on the roof is precarious in any weather; in snow, it’s almost definitely not a wise course of action unless you absolutely know what you’re doing. For everyone else, the safest path is to hire an insured pro, someone who has not only the proper equipment, but also the right experience for the job. If you have a single-story house, though, one whose roof you can access while keeping your feet firmly planted on the ground, then a roof rake can be an effective, user-friendly way to clear excess snow. Roof rakes are readily available online and in most brick-and-mortar home center. Before you start raking away, take heed of this important point: Don’t try to remove all the snow. In doing so, you could damage the roofing material, which would leave the roof vulnerable to leaks. To prevent this from happening, some roof rakes are fitted with rollers that keep the edge of the rake safely away from the shingles. 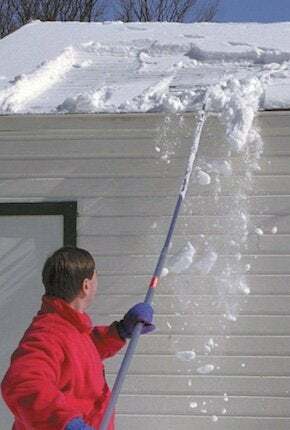 One last word of caution: Pay attention to where the snow you’re pulling off the roof is likely to wind up. You’ll want to pick a landing spot other than your head or the heads of bystanders!